Put your hands in the air, but be careful not to drop your iPhone. iZotope and dance music brand Ministry Of Sound have announced a special iPhone/iPod touch version of the iDrum app that enables users to create their own dance anthems. iDrum: Ministry Of Sound Anthems is said to contain over 300 classic and old-school dance samples (does this mean that they come from commercially released tracks, we wonder?) and features 20 kits to play with. The beats can be customised, and you can record your own by tapping the screen. Commenting on the launch, Van Uong, licensing account manager at Ministry of Sound said: "This is a truly unique experience where some of the best known dance music sounds of the last two decades are now available to be recreated on iPhone at the touch of a button." Whether this will mark the start of a new trend that sees artists and bands releasing album-specific iPhone apps remains to be seen. However, with record companies constantly on the look out for new revenue streams, we wouldn't be at all surprised. 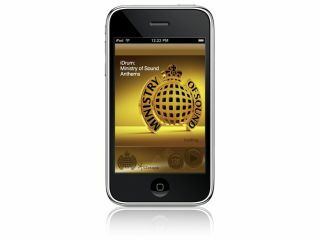 iDrum: Ministry Of Sound Anthems costs $5.99/£3.49 and is available now from the Apple App Store.